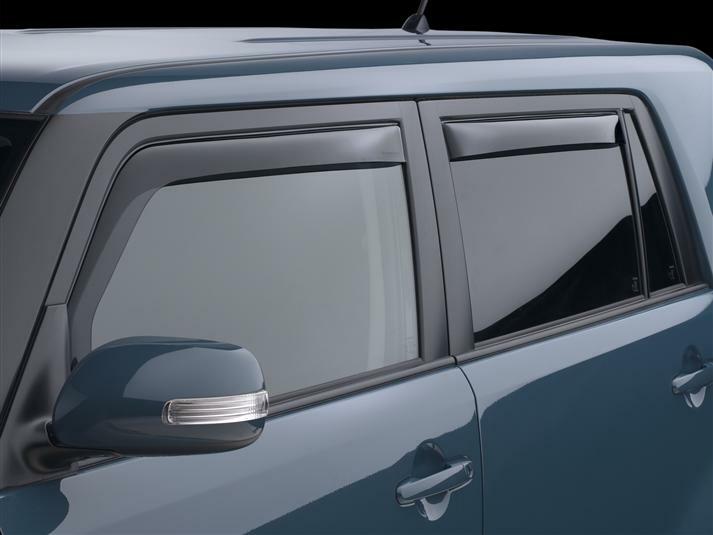 WeatherTech Side Window Deflectors are precision-machined to perfectly fit your 2009 Scion xB's window channel. These low profile window deflectors help to reduce wind noise and allow interior heat to escape. Our light tinted Side Window Deflectors are the only deflectors in the world made with a D.O.T. (U.S. Department of Transportation) approved glazing material. Available in light and dark tint for most vehicles. Designed and Engineered in USA – Handcrafted in Germany. Saw a set on a friends vehicle and liked the fact that there was no adhesive tape so I bought a set. I am usually a very hard person to impress, but I had to respond to this request for a comment. The window deflectors I got for my Scion literally were a snap to install. I was expecting the usual glue on type that would be hard to install. These were the type that just fit right in the window track. The front ones didn't even need any stickers. I had them installed in under ten minutes. They fit perfectly in the tracks and don't get in the way of the windows at all. I am thoroughly impressed! What a great product and the price was good too. Most of the other sites I looked at wanted three times the price of these. I would and have already recommended Weathertech to anyone looking for car accessories. The window deflectors I got, saved me some gas by not using my AC as much. I just wish they made a bug deflector for my car model so I can keep my windshield clean. After managing a family owned auto parts store for over 20 years, i have sold all brands of aftermarket accessories. Now that i have retired from that business and moved 600 miles to the beach, i need protection from the rain and sand. I have always used WeatherTech/MacNeil products in my vehicles and will continue to do so. Their Side window deflectors fit perfectly and add to the look of the vehicle. And the Floorliners are the perfect addition to keep my carpets clean from bad weather and beach sand. [It gets everywhere!!] Their products also add to the resale value of my vehicles as i seem to be getting different ones all the time.